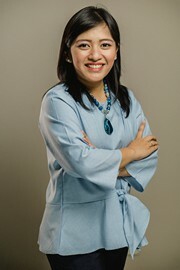 Niken holds a master's degree in economics and public policy from Sciences Po in Paris, France and an undergraduate degree in economics from the University of Indonesia. Niken is a senior researcher specializing in quantitative methodology. Her main research interests include female-headed households, migration, inequality, and social assistance programs. She is responsible for leading several household surveys done by The SMERU Research Institute. After graduating from Universitas Indonesia, Niken worked as an auditor at the Ernst and Young Indonesia. Her passion in development economics brought her to a career change as she decided to join Bank Indonesia as a research assistant before pursuing her graduate study in Paris. Niken is a 2010–2012 TOTAL Master Scholarship awardee from TOTAL E&P Indonesia for her postgraduate study at the Sciences Po, Paris. In 2012 she received the best thesis award for the master program of Economics and Public Policy. Her thesis, titled ‘Migration, Money, and Education’, examines the impact of migration and remittance on children's schooling in Senegal by applying the propensity score matching (PSM) to correct potential selection bias among migrants and remitters.